Want us to review this product? We’ve not reviewed this product yet, but please let us know if you would like us to. Prime performance with your ProWave. 2015 sees the ProWave range take SUP wave riding to the next level, with shapes that complement a rider’s search for radical manoeuvres, speed and control. This year we introduce five brand new shapes ranging from 7’6″ to 9’2″ while the well regarded 9’6″ and 9’10” make up the rest of the range to create the most extreme high performance wave riding collection. The smallest SUP in the Fanatic range, the 7’6″, is impeccably balanced and easy to paddle with quick acceleration. Once unleashed onto a wave it speaks for itself giving you an exceptionally responsive ride. The wider nose and squash tail design of the range offers more stability in the smaller models, whilst retaining highly responsive turning capabilities in the larger ones. A thinner rail profile provides more grip and drive through the turn. 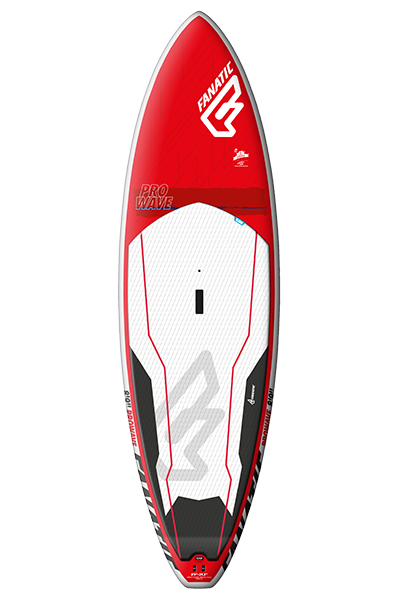 The 9’6″ has enough evenly distributed volume to carry any rider weight while delivering Shortboard SUP performance. The 9’10” Semi-Gun is a slightly stretched version of the 9’9″, designed for speed and charging big waves. It was the first SUP to conquer Shipstern’s Bluff / Tasmania! A Quad or Thruster fin setup gives you the ultimate flexibility to adapt the board to your style of riding or the conditions of the day. A subtly domed deck and a balanced volume distribution provide optimum paddling efficiency and ease for catching waves. Riding down the line, the ProWave performs with outstanding flow making light work of BIG conditions. Mastfoot insert for Windsurfing option. What do you think about the ProWave HRS 9’6”? Why do we ask? It’s your opportunity to help other SUPboarders make the right kit choices and help brands improve their products. It’s a win-win! How could the product be improved?